Attempting to interpret “bigger” and “better” has long been a parlor game played in the salons aboard the world’s finest superyachts. From multiple helipads to reflective glass construction to hybrid propulsion systems, shipyards continue to innovate almost beyond imagination. According to the information we have, there are currently 20 new builds over 262 feet (80 meters) in length in various stages of construction. 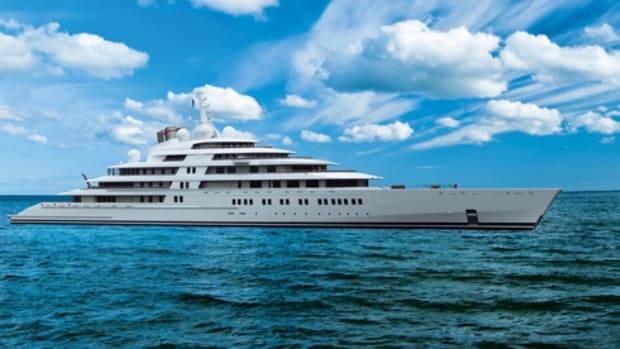 Dutch builders Feadship, and Oceanco and German builders Lürssen and Nobiskrug are the leading builders of very large yachts, but there are also mega-projects at other shipyards. The largest of which we are aware is the 596-foot (182 meter) Project REV at VARD Group in Norway. This edition of Yachts International’s annual review of the Top 100 defines new yachts as having launched from May 2017 to June 2018, whether or not they have been delivered to their owners. We’ve also made room this year for two entries that fall outside those dates, but whose information has just now become available. 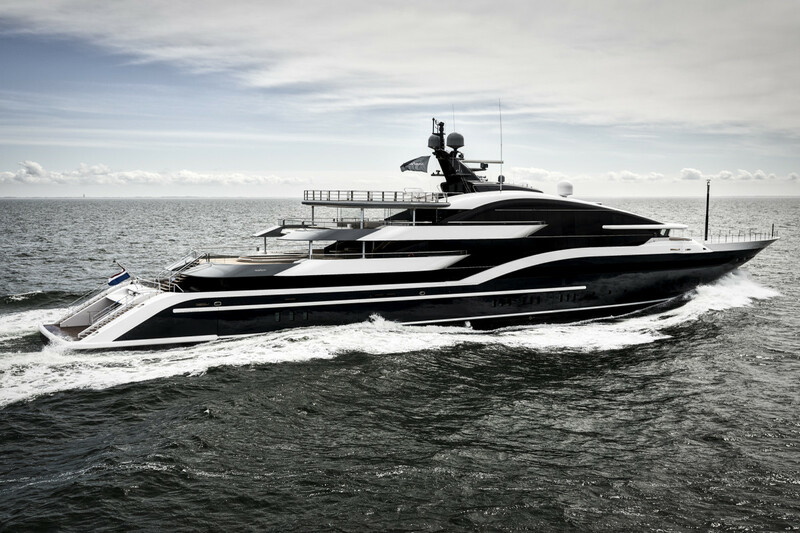 Built for an experienced owner who was directly involved in construction, Project SHU represents a milestone for Lürssen in terms of size and complexity, according to CEO Peter Lürssen. The yacht’s proportionally balanced exterior by Espen Øino belies her volume. A swimming pool runs transversely on the main deck aft, and there are two helipads, on the bridge deck and sundeck. Project SHU has multiple sea terraces and platforms. Lürssen describes the interior design by Mark Berryman as calm, with soft neutral tones and tactile finishes. Project SHU recently completed sea trials and is scheduled for delivery this autumn. 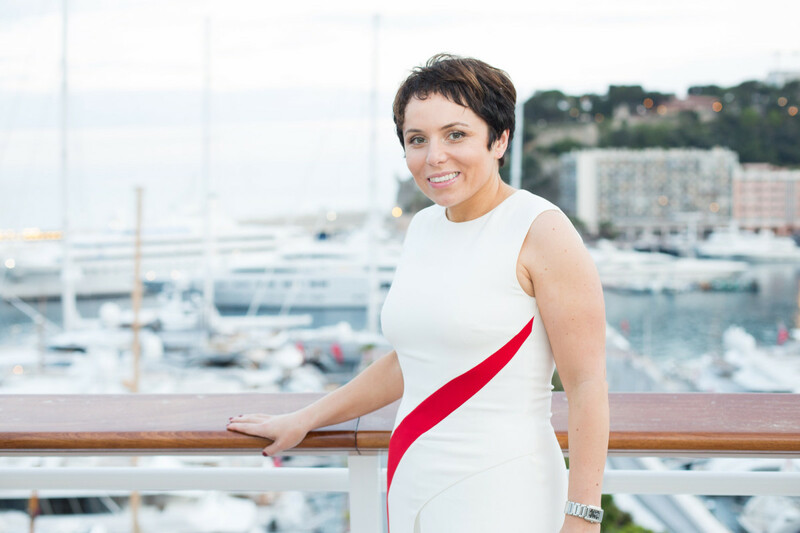 "Project SHU represents a major milestone for Imperial," says Julia Stewart, of Imperial Yachts. "Being involved in impressive superyacht projects like these show our capacity and experience in superyacht and megayacht management, with regular deliveries of 80-meter-plus projects supervised and operated by our team since 2015. 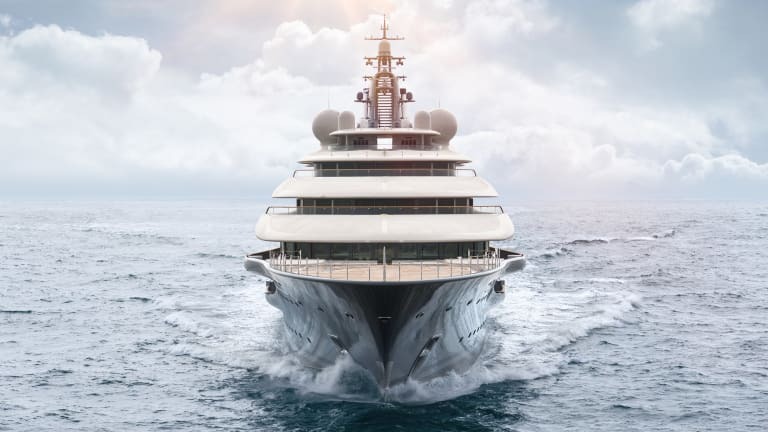 Our strong and very dynamic links with Lürssen, Espen Øino and Mark Berryman helped to achieve one of the most impressive vessels of the next decade." Project Tis hit the water in 2016. She has a beam of 55 feet, 1 inch (16.8 meters) and carries a long, well-balanced sheerline. Her exterior and interior styling by Winch Design includes six decks for guest use, with some sizable ceiling heights. Also notable is the sweeping staircase on her stern. Moran Yacht & Ship handled project management, with delivery scheduled in 2018. Due to confidentiality agreements, only a designer&apos;s sketch is currently available. 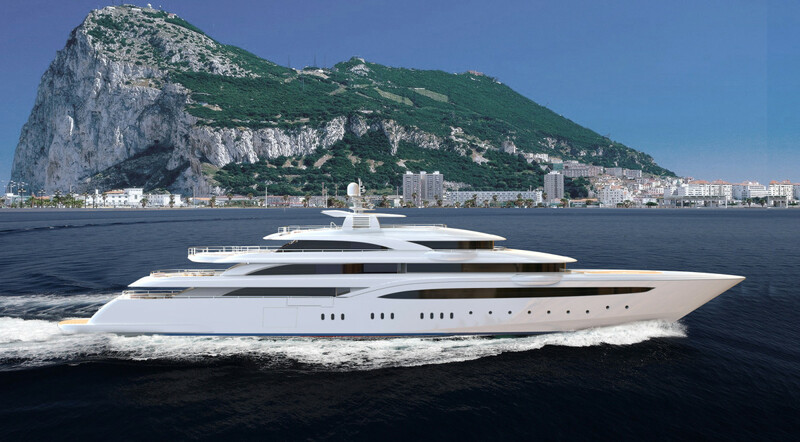 "Moran Yacht & Ship sold Project Tis to a longtime client," says Rob Moran. 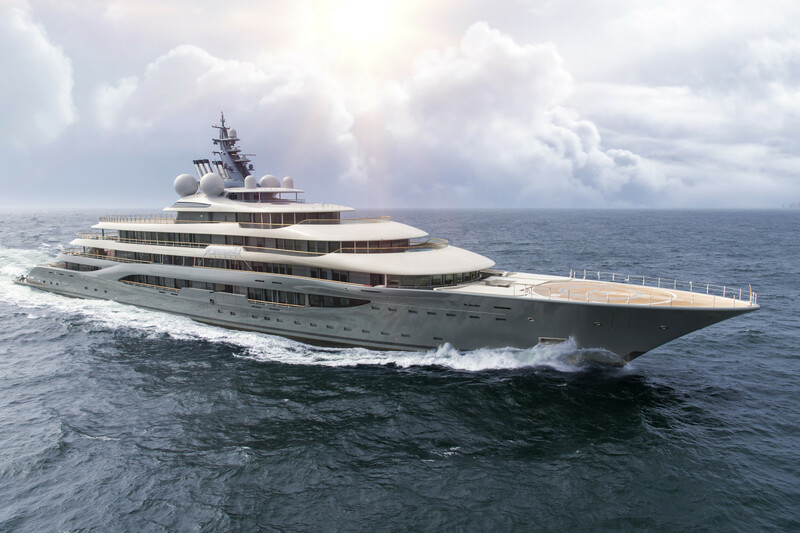 "She is just one of the 23 new construction projects that Moran Yacht & Ship has built and sold at the Lürssen shipyard in the past 18 years. We have six additional huge projects currently under construction at Lürssen and are aggressively working on several new projects that we expect to sign in 2018. Tis is being built to the Passenger Yacht Code and features an enormous master stateroom with eight guest suites. Other features are a ‘Gone with the Wind’ main staircase, cinema, huge spa area and magnificent Winch Design interior designed and built with no cost parameters. The vessel will be delivered this winter." Anna (No. 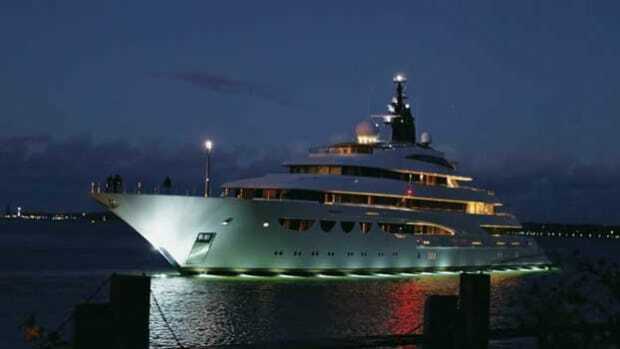 1007) is the largest yacht Feadship has built, topping the 333-foot (101.5-meter) Symphony in 2015. 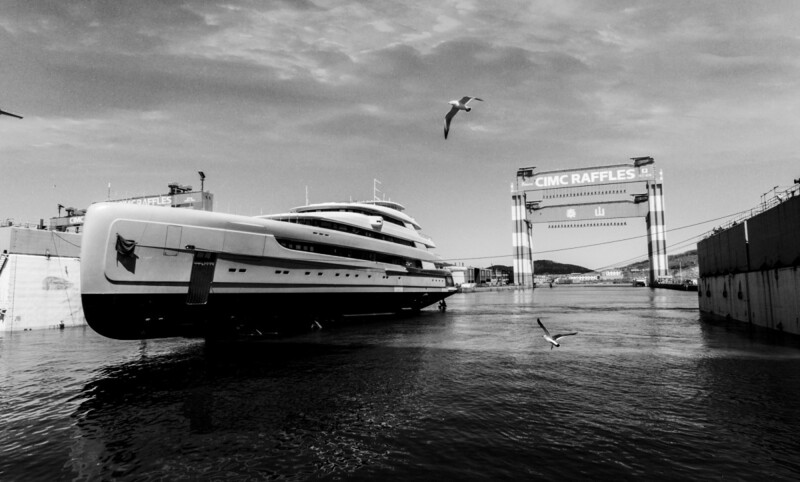 Feadship Anna is also the second-largest yacht built in the Netherlands, after the 361-foot (110-meter) Oceanco Jubilee. 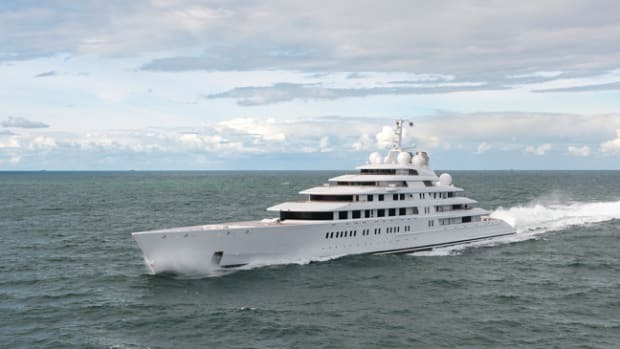 Naval architecture for Anna is by Feadship De Voogt, and interior and exterior styling are by Michael Leach Design. With a steel hull and aluminum superstructure, she has a dramatic architectural curve that links the main and upper decks. Hatches in the side decks indicate that there may be tender garages and a beach club. 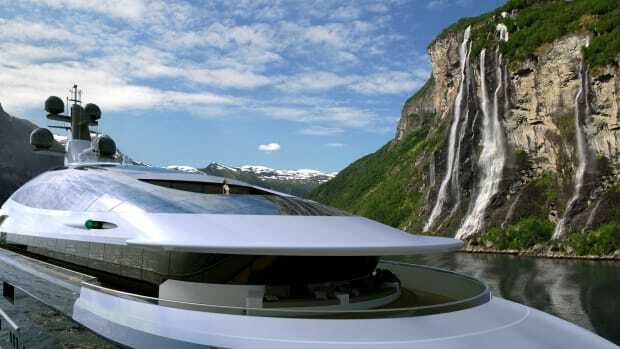 Dar (formerly known as Oceanco&apos;s Project Shark, or Y717), with exterior styling by DeBasto Designs and interiors by Nuvolari Lenard, explores the latest advances in glass technology. Her superstructure is finished in reflective glass. From the interior, the glass allows sole-to-ceiling views aft, port and starboard, all while the yacht’s profile remains long, sporty and lean. The upper deck is dedicated to owners, omitting walkaround crew decks in favor of private balconies. The name Project Shark came from her wing stations that, when viewed from above, resemble a hammerhead shark; the mast, in profile, is shaped like a fin. Sycamore fiddleback, Brazilian carbalo and bleached gray maple are among the woods on board. Accents include bas-reliefs, metallic surfaces and 3-D cut leather panels. Dar was delivered in July. "From the beginning, the owners wanted a very light and bright feeling aboard: no dark timbers," says Valentina Zannier, of Nuvolari Lenard. "They specified alternative materials such as wallpaper, 3-D lacquer, exotic upholstery, cut leather panels, metallic surfaces and bas-reliefs. The main theme is nature, starting from blossom cascades to feathers, fish, waves and so on—all integrated and interwoven throughout the interior. I used different shades of sycamore fiddleback, small details in tinted Brazilian carbalo wood, and I used a lot of treated and bleached maple wood. Skillfully executed curved floor planks are part of the design. The richness of Project Shark [Dar] is expressed by the quality of the details and the tasteful combination of complete bespoke finishes." "The owner’s brief specified two large, offset umbrellas on the upper deck aft, port and starboard. The traditional solution would have been to have a supplier fabricate removable shades and poles. Those poles tend to be heavy and need to be moved to somewhere belowdecks to be stowed. I proposed a hinged L-shaped pole, rotating sideways at the base. The overall shape of the L matches the deck corner perfectly. When in the up position, it offers the same convenience as a regular offset umbrella with an off-center pole. When it’s time to lower the umbrella, it simply rotates down and disappears into the deck corner—no need to carry it anywhere. As an added advantage, it can also be rotated from the other end of the L, so it can come from the side or from the back of the deck. It can be raised from both ends. It is really cool." "The helideck required stairs for access," adds DeBasto. "The only location possible was through a shape that, incidentally, is a really important feature that defines the overall profile. I could not simply remove that shape to make an opening for the stairways. The solution was to create a couple of hatches, one per side, with pantographic hinges. When closed, the overall profile is not disrupted. The added advantage is that during takeoff and landing of the helicopter, they remain closed, protecting the owner’s deck below from wind and noise." Illusion Plus is the new flagship of Pride Mega Yachts in Yantai, China. 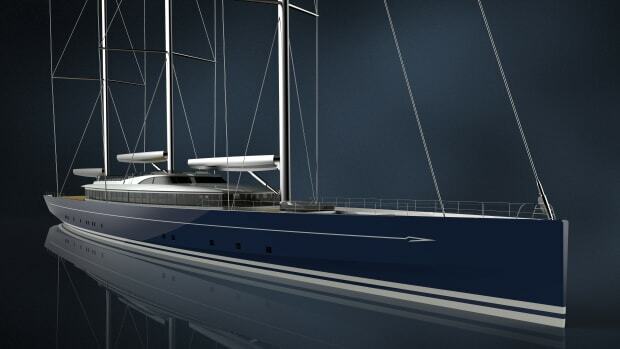 Tim Saunders Yacht Design in the United Kingdom is responsible for her exterior. Sinot Exclusive Yacht Design, in the Netherlands, created her interior working with Pride’s in-house department, and Greenline Yacht Interiors from Dubai did the interior fit-out. There are sole-to-ceiling windows, a volume of 3,603 gross tons, six decks, accommodations for 16 guests in eight staterooms, and quarters for 25 crew. The propulsion is Rolls-Royce diesel-electric. Three custom tenders are in a garage, and the lower-deck spa has a sauna, steam room and massage room. 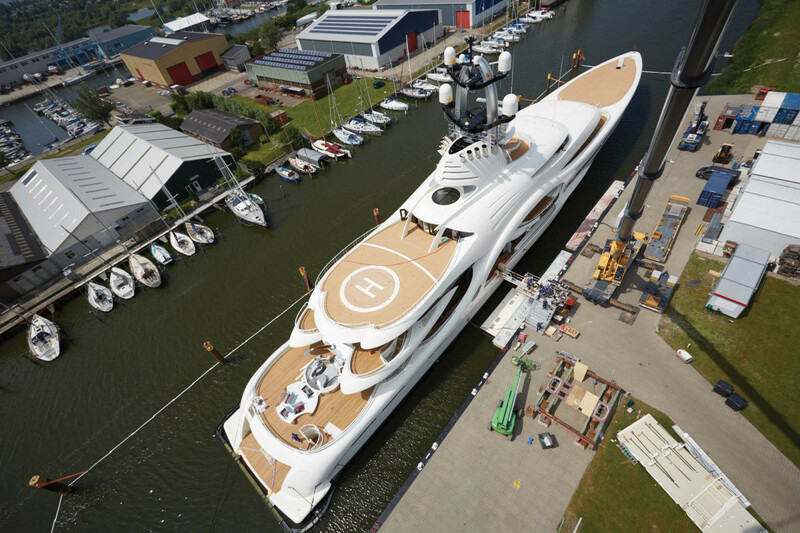 Two spa pools are on the upper decks, and a touch-and-go helipad is on the foredeck. Y.CO is the central agent for sale, with an asking price of $145 million. Delivery is scheduled for the third quarter of 2018. 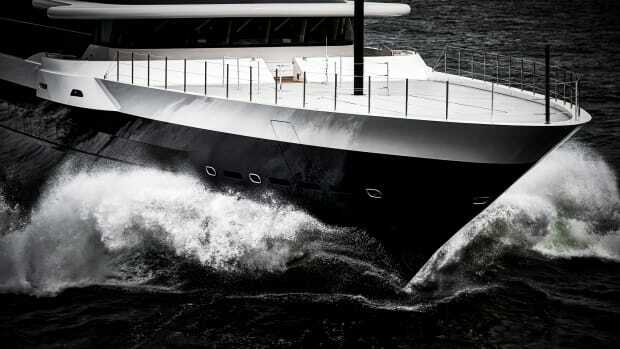 "I have been significantly involved in the concept origination and design of the Illusion Plus project from the very start," says Tim Saunders, of Tim Saunders Yacht Design. "My role, while I was partner at Rainsford Saunders Design, was to create a winning exterior design and to innovate a worthy hull platform. The design brief made reference to the Rolls-Royce automobile. 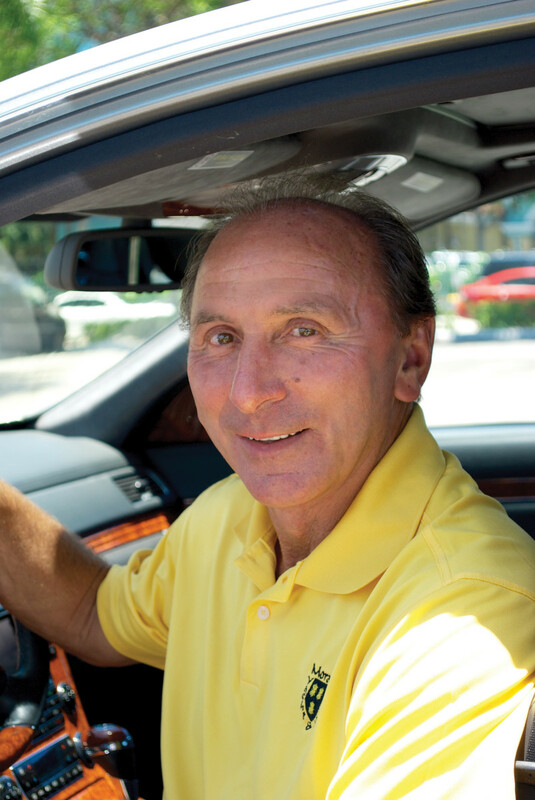 As a trained automotive designer, I was delighted to identify selected lines, curves and proportions embedded deep in the DNA of the Rolls-Royce brand that give their owners the feeling and perception of power, presence, performance and prestige." "The challenge lay in creatively translating these automotive elements into something which would positively augment the aesthetic, practical and safety attributes required on board a yacht. At each step of the concept design spiral, there was evaluation and discussion. I knew it was essential to create an exterior design that would stand the test of time and strike the correct balance between cutting-edge aggressive lines—which typically suggest the future—and the softer, more feminine lines, which tend to offer a more timeless quality. The vessel’s internal layout, guest/crew circulation, and placement of machinery was essential: a 21st-century megayacht can be likened to a small city rather than a yacht of yesteryear. The carefully considered design offers her guests vast internal sun-kissed suites and public spaces with unparalleled views. To follow in the automotive philosophy, Illusion Plus is fitted with a powerful and cutting-edge diesel-electric Rolls-Royce power plant and Azipull pod drives. This hybrid vessel is capable of great speed, efficiency and agility, not to mention a dynamic positioning system, all of which may be precisely controlled at the touch of a joystick." With a beam of 45 feet, 4 inches (13.8 meters), the Greek-built O’Ptasia is by father and son Giorgio Vafiadis and Stefano Inglese Vafiadis of Studio Vafiadis. 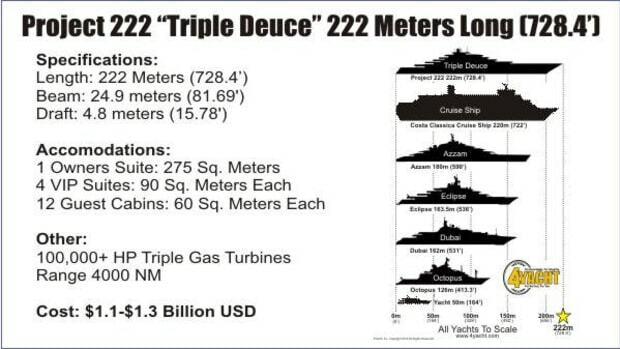 She has a gross tonnage of 2,450 and displaces 1,830 tons. Naval architecture is by NHellas. O’Ptasia, designed for charter, has 11 staterooms, six of which are on the main deck. Four are on the upper deck, including an owners’ suite, two double staterooms and a twin-bed stateroom. There is an additional cabin on the lower deck that may be used for guests or staff. Amenities include an elevator, a beach club and a spa with a steam room, massage room and bar. The bridge deck has a gym and wellness center, and there’s dining on the sundeck. A touch-and-go helipad is forward on the main deck. 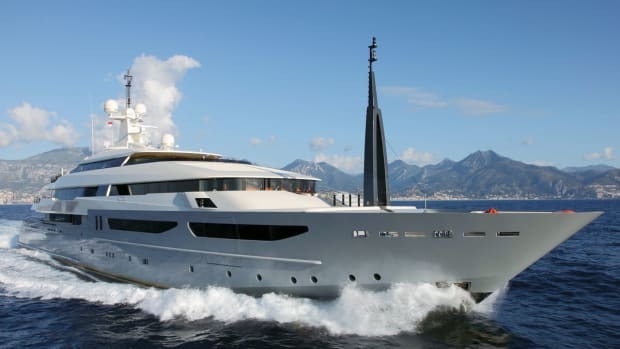 Atalanta Golden Yachts is the central agent for charter, with a weekly base rate of about $950,000. "One of the most important design features aboard O’Ptasia is comfort," says Stefano Vafiadis, of Studio Vafiadis. 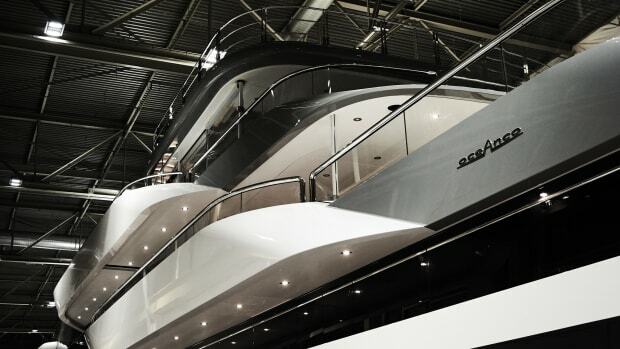 "She is a yacht born to create the best lifestyle experiences for those aboard. Some of her cool features include the vast beach club with a spa that has a massage room and a steam room, adjacent to the sea…perfectly situated for a relaxing retreat after playing in the water. On the bridge deck is a spectacular gym facing a 20-foot (6-meter) swimming pool surrounded by side sunbeds and a panoramic aft sunbed overlooking the horizon. Climbing the external stairs, one arrives at the flybridge, a space dedicated to entertaining with a dining table, bar and many different seating lounges. 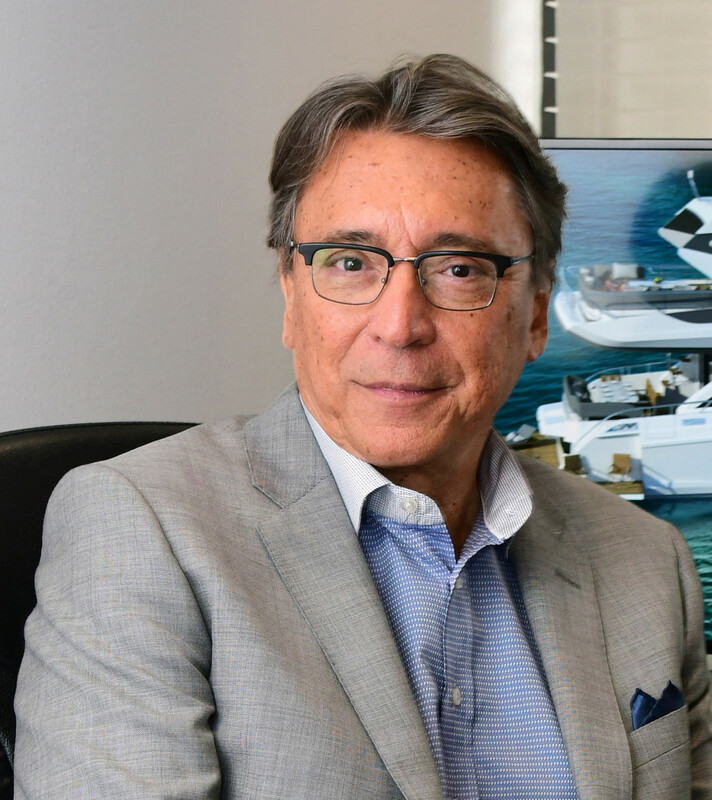 "One of the main challenges of O’Ptasia was to design a fully equipped helipad on the bow of the boat that was perfectly integrated with the lines of the boat," adds Vafiadis. "Another challenge was ensuring the spaciousness of the interior. To that end, the engine room is designed in a way that it continues under the garage on the tank deck, reducing the length on the lower deck and adding space for the beach club."